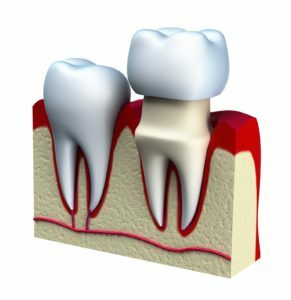 Dental crowns are natural-looking, tooth-shaped caps that cover a damaged or missing tooth, restoring a full and beautiful smile. Dentists cement these caps into place to provide both strong and visibly appealing replacements for natural teeth. Crowns are usually necessary when the tooth is broken down to the point where a filling will not be effective. Dental crowns are a very reliable solution for major dental problems that have resulted in a severely damaged or missing tooth. The dental crown process typically takes place in two appointments. At the first appointment, Dr. Roberts or Dr. Sirota prepare the tooth numbing, then by filing or reshaping, so the crown can fit in securely and comfortably. Next, our staff will take an impression of the teeth and gums using a paste or putty. Finally, we send the impression to a laboratory to make a custom crown, which usually takes two to three weeks. Patients receive a temporary dental crown until the permanent crown is ready. At the second appointment, the new crown is inspected for proper fit and tooth color. The temporary crown is then removed and the new one is cemented onto the tooth. At Prosthodontics of New York, we pride ourselves on our advanced technology. Patients have the option to receive CEREC same-day crowns in one convenient appointment. Drs. Roberts and Sirota will discuss the type of crown and timeline of your procedure at your consultation. Pain or Sensitivity When Biting – This usually means that the crown is too high on the tooth. If this is the case, our dentists will be able to adjust the crown. Chip in a Porcelain Crown – Resin can be used to repair the remaining crown. If the chipping is extensive, patients may need an entirely new crown. Loose Dental Crown – If the cement washes out from underneath the crown, bacteria can then leak in and cause decay. Missing Dental Crown – if the dental crown falls off entirely. Our dentists may be able to replace or create a new crown as necessary. If you think you may need a dental crown, call 212.758.9690 to schedule a consultation at Prosthodontics of New York. Our practice serves Manhattan, New York City, and surrounding areas.